TransferPlan will transfer you from and to Agia Pelagia as quickly, safely and comfortably as possible. Agia Pelagia is a seaside fishing village built in the centre of a picturesque amphitheatric bay, 23 km northwest from Heraklion Town. The main beach getaway of Agia Pelagia is a long, narrow, sandy beach with emerald waters. The round shape of the beach resembles a plate, thus in Ottoman times, the beach was called Tsanak Limani. Due to its formation, the waters are almost always calm and the bay is used as a little harbour. In Agia Pelagia visitors will find many options for water sports, scuba-diving, traditional Cretan food and accommodation. 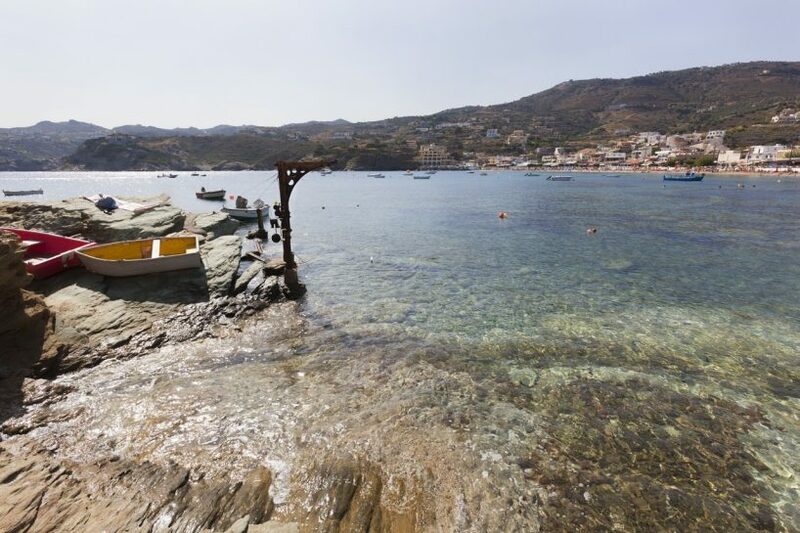 Agia Petra is home to a beautiful sandy beach located in the Cape Souda, thus it is almost never windy. In Cape Souda various ancient ruins have been discovered which belonged to the Apollonia port city. Snorkelling is a great activity as the visitors can spot plenty ancient remnants such as shipwrecks wrapped in the deep blue waters for eternity. A few steps away from Agia Pelagia beach, one can find a monastery that boasts the same name as the town and is dedicated to Saint Pelagia. The monastery was a renowned place of worship during the Venetian occupation and it hosted a huge annual celebration on the holiday of the saint the monastery was dedicated to. If you walk past the shrine you will be surprised by the most mesmerising and scenic beach in the area named Fylakes. The beach is located within some rock formations, which mean you will have to trek for a bit in order to get there. Fylakes is covered with golden sand and segregated into two small coves which are filled to the brim when tied rises. The water has a beautiful emerald colour and it is crystal-clear, making up for the tedious way down visitors must do. In close proximity to Agia Pelagia, one can find Ligaria inlet on the east and Mononaftis Bay on the west. The landscape encompasses some of the best qualities of the Aegean scenery with its picturesque white houses, the emerald waters of the Mediterranean, the rolling hills of green and the brown rock formation put together a scenery of great beauty that will excite even the most demanding travellers. Book your Crete cab transfer now. Enjoy a high-quality service at the lowest prices. Best price guaranteed. That’s why we are Crete’s favourite airport transfer company.